I’d like to introduce you to one of the best things to ever happen to a singer or speaker wanting a better vocal sound: It’s a gadget called “HearFones”. I’ve been offering them in my private vocal coaching practice for a couple of years now and they fly from my shelves so fast it’s hard to keep them in stock! 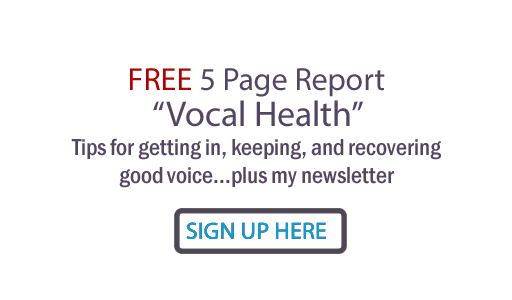 What they do is magnify your true vocal sound back to you… and they are a major improvement over the old cup your hand in back of your ears method. 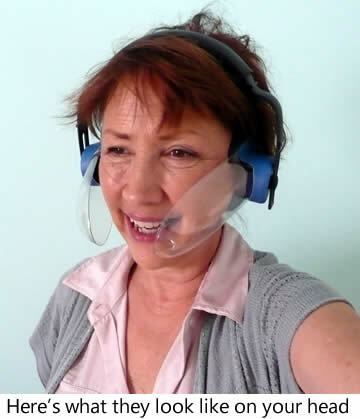 You can adjust the volume by twisting the clear plastic extensions up and down at your ears so you pick up only as much of your voice as you want. Lots of choir members use them when rehearsing so they pick their own voices out and hear themselves individually within the group. But I also use them with soloists, recording artists and speakers I train. They let you hear how you really sound to others rather than how you think you sound. Ever been surprised at your recorded voice? You may find that your sound quality needs improvement… and the instant feedback enables you to hear whether or not the techniques you’re trying are working! They encourage backing off excessive, pushy air pressure that causes stripped gears for so many passionate singers and speakers. They help the vocalist achieve the fine balance between breath support and breath control… which my students know is an integral part of my Power, Path and Performance vocal training method. They help a singer focus on pitch. And yes, you can indeed hear your music with them on because they are open and let sound in from outside. They are incredibly helpful when mimicking another voice. In other words, they enable you to learn style, vocal licks and melody by singing with another singer yet hearing your own voice clearly. They enable you to practice in settings where you don’t want to disturb neighbors. Your voice sounds unamplified to anyone listening. They can save you money in your practice room… You don’t need a live mic or PA system to practice with HearFones. And you can wear them to rehearse with an unplugged mic to practice good mic technique.. They are a great tool when preparing for studio or gigs because they let you experiment and memorize the techniques and muscle memory you want for your best performance. They protect your voice during loud, full-band rehearsals … you don’t have to scream over instruments so they help save your voice for the actual gig! 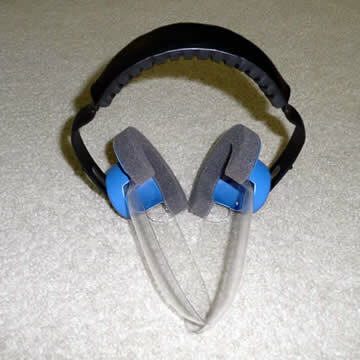 HearFones are durably well-built by Nextel Corporation in Maine, USA. They fold for travel… perfect for the road or a thin-walled practice room! +$5.00 shipping for US orders. Contact Judy regarding additional shipping costs on international orders.